A recent paper, “Inequality and Social Security in India”, published in the just-released Oxfam study, “Mind the Gap: State of Employment in India”, has pointed towards pitiable condition of social security in India, which covers only 8% of the workers, adding, things are particularly bad for marginalized sections. Thus, according to the paper, authored by by Ravi Srivastava, director, Centre for Employment Studies, Institute for Human Development, formerly professor of economics, Jawaharlal Nehru University, New Delhi, social security is available to 4.7% of ST workers, 5.8% SC workers, 6% OBC workers, and 8.3% to Muslim workers, which is almost half the number when compared to their Hindu counterparts (16.6%). The paper further says, India spends 1.4% of its GDP on social protection, which is amongst the lowest in Asia, and far lower than China, Sri Lanka, Thailand, and even Nepal, adding, the share of total expenditure under social security schemes is a meagre 0.5% of the total budget 2018-19. Since 2014-15, the Central government has moved towards an architecture which combines the unique identification of every individual with the payment of benefits through bank accounts facilitated by mobile-based applications. This was famously described in the Economic Survey of 2015-16 as the JAM approach, namely combining financial inclusion through a no-frills bank account (through the financial inclusion programme called the Jan Dhan Yojana), unique identification number through the Aadhaar programme, and use of Mobile. The Pradhan Mantri Suraksha Bima Yojna (PMSBY) with accidental death risk cover of INR 2 lakh for a premium of just INR 12 per year. The Atal Pension Yojana (APY), which will provide a defined pension, depending on the contribution, and its period. To encourage people to join this scheme, the Government announced a contribution of 50 percent of the beneficiaries’ premium limited to INR 1,000 each year, for five years, in the new accounts opened before 31st December, 2015. The Pradhan Mantri Jeevan Jyoti Bima Yojana (PMJJBMY) which covers both natural and accidental death risk of INR 2 lakhs. All these schemes built upon earlier schemes, the Svavlamban Scheme and the Aam Aadmi Bima Yojana which were partially modified and woven into the financial inclusion architecture. Notably, the three schemes introduced were all contributory schemes although they contained an element of subsidy. The trinity of schemes announced in FY 2015-16 signaled the government’s clear intention to move to a contributory social insurance mode of social security with minimum budgetary support and with some tweaking of earlier schemes. Premium contributions are restrictive and constitute a first charge on meagre savings. There has been an attempt to link the premium for these schemes to other schemes such as schemes for building and construction workers and Mahatma Gandhi National Rural Employment Guarantee Programme (MGNREGP), but despite this, off take from the schemes has been limited. Clear data on progress of these schemes is not available. According to a release by Pension Fund Regulatory and Development Authority (PFRDA), the number of subscribers to the scheme had crossed 11 million at the end of three years in May 2018 with a total contribution of INR 3,950 crore. This would amount to a coverage of about 2.3 percent of the informal workforce, provided these subscribers stay in the scheme. However, there is no data on issues such as the mandatory linkage of these schemes with other schemes or the number of subscribers contributing regularly to the scheme since 2015-16. Membership of the two smaller schemes is larger. A Press Information Bureau (PIB) release issued on August 7, 2018, mentions that gross enrolments in the Pardhan Mantri Suraksha Yojana scheme was 13.74 crore in 2017-18. According to data on the Central government’s data portal, till February 2017, with 9.89 crore enrolments, the government had received only 11,163 claims and had processed 7,820 out of these. 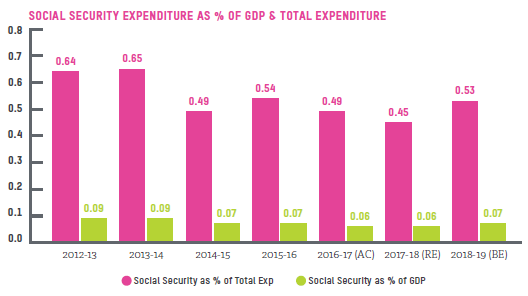 With the government’s exclusive focus on these schemes, expenditure on social security schemes has languished. Expenditure on social security schemes has been lower in all years since 2014- 15, compared to 2013-14, even in nominal terms. A small increase has been budgeted in 2018-19 due to the proposed National Health Protection Scheme. The total government contribution to the Atal Pension Yojana remains below the level of the erstwhile Svavlamban scheme. Similarly, the government subsidy for the Atal Pension Yojana in all years till now has been below the level of government contribution to the Aam Aadmi Bima Yojana in 2014-15. Even with the proposed increase in 2018-19, the expenditure as a share of GDP/ total expenditure will remain below the level of 2013-14. The expansion of social security schemes received a setback during the more recent period. Not only did the government not increase its commitment to spend more on these programmes, its reliance on contributory programmes was designed to keep the poorest and the most vulnerable out of the proposed social security net. In September 2018, the Government of India rolled out a massive health insurance scheme called Ayushman Bharat which is billed as the National Health Protection Scheme. The Scheme is eventually intended to cover 100 million poor families who will be identified on the basis of the Socio-Economic Caste Census (SECC) deprivation criteria in rural areas, and occupational criteria in urban areas. The Scheme will subsume the Rashtriya Swasthya Bima Yojana (RSBY) and the Senior Citizen Health Insurance Scheme (SCHIS). The Scheme will have a defined benefit cover of INR 5 lakh per family per year. Benefits of the scheme are portable across the country. The payments for treatment will be done on package rate basis. The expenditure incurred in premium payment will be shared between Central and State Governments. States will bear 40 percent of the cost of the Scheme. States are permitted to implement the scheme in insurance or Trust/ Society mode. The total expenditure will be determined on the basis of the actual market determined premium paid in States/ UTs where the Mission will be implemented through insurance companies. In States/ UTs where the scheme will be implemented in Trust/ Society mode, the central share of funds will be provided based on actual expenditure or premium ceiling (whichever is lower) in the predetermined ratio. Apart from institutional and administrative issues, there is a fair amount of controversy on the actual cost of the scheme to insurers/ providers, the ability of the Centre to provide the additional resources necessary, and whether states, which differ significantly in terms of health expenditure outlays per person/ per household will have the capacity to bear the cost of implementation of the Scheme. Till date, six states – Delhi, Kerala, Odisha, Punjab, West Bengal and Telangana – have opted out of the scheme for various reasons. By November 2018, the National Agency had put in a request to the Centre for an additional INR 4,500 crore, over and above INR 2000 crore allocated in the 2018-19 budget. There is also an apprehension that the resources for the new scheme may have been raised at the expense of another significant social protection programme, namely, the MGNREGP, in which unpaid arrears are said to be mounting.